We’d love your help. Let us know what’s wrong with this preview of Head of the River by Pip Harry. With six months until the big race, the twins can't It's the most elite school sporting event in the country. Nine rowers, 2000 gruelling metres and one chance for glory in the ultimate team sport. Sit forward ... ROW. To ask other readers questions about Head of the River, please sign up. Who would have thought a book about rowing could have grabbed me like this one did!! I loved the alternating chapters between sister and brother Leni and Cristian, it was extra interesting to hear from both of them. They were both under so much pressure to win, even though I don't think their parents were purposefully trying to put pressure on them, i felt that both parents wanted the best for Leni and Cristian and wanted them to be happy, but they didn't actually stop to find out what it was th Who would have thought a book about rowing could have grabbed me like this one did!! I loved the alternating chapters between sister and brother Leni and Cristian, it was extra interesting to hear from both of them. They were both under so much pressure to win, even though I don't think their parents were purposefully trying to put pressure on them, i felt that both parents wanted the best for Leni and Cristian and wanted them to be happy, but they didn't actually stop to find out what it was that would make Leni and Cristian happy. The way that the book started out, you know that something bad has happened to someone and throughout the story, I was trying to put the pieces together to work out who it was, and when it happened, it wasn't shocking but it hit hard. Head of the River is Pip Harry’s second novel. Set in Melbourne, seventeen year old Leni and Cris Popescu are twins, children of former Olympian rowers, and are in their final years of school at Harley Grammar. Both were taught to row at a young age and are now in preparations for the Head of the River, the most important race in the school year. Leni is feeling the pressure and Cris is starting to realise that rowing is not what he wants to do anymore. I adored both Leni and Cris and the dual na Head of the River is Pip Harry’s second novel. Set in Melbourne, seventeen year old Leni and Cris Popescu are twins, children of former Olympian rowers, and are in their final years of school at Harley Grammar. Both were taught to row at a young age and are now in preparations for the Head of the River, the most important race in the school year. Leni is feeling the pressure and Cris is starting to realise that rowing is not what he wants to do anymore. I adored both Leni and Cris and the dual narration worked perfectly. Being twins they are so in sync, not that they don’t have arguments and rivalry, but the bond between them was so sweet. And while being very similar, they’re also quite different: Leni is serious, determined, focused, sometimes to the point of seeming unfriendly, which also means she’s lonely. Cris on the other hand wants to relax more and no longer wants to win as much. Both feel the pressure due to their parents’ legacy, but their parents were really supportive and present throughout their story. There were so many tender moments between the four of them, I loved the Popescu family. Cris is struggling with his weight, he comfort eats, didn't work out as much over the holidays, and finds himself heavier than the rest of the boys. It was so refreshing to read about weight issues from a male perspective, and instead have Leni wishing to be bigger and more muscular. I could understand Cris going along with the plan to use drugs to get himself back in shape, and the topic was dealt with sensitively and realistically. The book starts two days after the race and then jumps back to six months earlier, and I was hooked on Leni and Cris’ story from the start. It’s clear something serious happens at the race and slowly their story unfolds, detailing the enormous amount of time and effort that goes into their training. Was Leni going to get the win she so wanted? Was Cris going to get caught taking drugs? I took on all their nervous energy while reading and was anticipating the outcome. There’s a romantic element for both twins, more so for Leni, but I really liked that it wasn’t the sole focus of their story. Leni is dating Adam, but has her eye on new boy, Sam. It was great to see Leni’s growth over the course of the story, specifically when it came to Sam, and to the rest of the rowers. For anyone put off because they have no idea about rowing, don’t be. Firstly, there’s a glossary of all the rowing terms, and secondly, everything is so vivid that you’ll be able to picture the rowing scenes easily, even if you've never picked up an oar. Pip Harry has done it again, Head of the River accurately captures those awkward teenage years, filled with embarrassing parents, the pressure to achieve, and fumbling romances. This is a moving and captivating story with a bittersweet ending, sure to be loved by teens and adults. Thank you to the wonderful people at UQP for my review copy. Loved this story for its characters, its heart and its originality. It smashes gender stereotypes and gives those of us non-athletes a glimpse of the pressures of competitive sport (internal and external). I laughed out loud (great dialogue! ), loved the dynamic between siblings Leni and Cris, and got a little choked up towards the end when everything comes to a head (no pun intended). You don't have to be into sports to enjoy this one. Head of the River is quality contemporary YA, Pip Harry rocks. You don't have to be into sports to enjoy this one. Head of the River is quality contemporary YA, written by an author who's going from strength to strength. Definitely a YA book written by an author who loves rowing. Rowing seems to me to be a sport for those who are tall, fit and focused and this book certainly captures the feel, smells and aches of this sport. The alternate chapters narrated by the twins Leni and Cris work well as they deal with the pressure to perform, high expectations, relationships and schoolwork. The message of the danger of performance enhancing drugs was also well told. Jump ahead and it Two days after Head of the River and Harley Grammar is subdued at morning assembly; instead of singing ‘We are the Champions’ and back-slapping the rowing stars, the entire school is in a state of mourning for an unnamed but seriously ill student. "In no other sport does the word team mean so much than in rowing." Have you ever picked up a book and thought, This book is for me, about me. This book is mine. Reading Head of the River was like picking up a book about my life and changing a few characters and situations. So for those who don't know I row. I've been racing for eight years. I've been rowing for 13 years. And, thanks to my dad, I've been around rowing my whole life. My dad was a rower himself, but unfortunately due to a back injury he had to stop but he still coaches and helps in the running of regattas. For my whole life I've been known as 'Laurie's daughter.' I've been chasing a ghost every time I get into a boat. I've struggled with the concept of being the daughter to a legend in such a small community, with being treated with respect or contempt I never earned. To always being treated differently to my peers for something I have no control over. Although this has made me the person I am today, and a better judge of character it's still hard to be faced with something like treatment that differs to the other competitors when you're 13 because of who you're related to. I connected so well with Leni, she had so much to live up to and although she knew her parents would be proud no matter what, she still felt that anything other than first place would pale in compare to their previous accomplishments. I see that gold medal every day. It makes me feel like I have so much to live up to. I wouldn't want to swap my rowing experience for anyone else's and I feel like that would be the same for Leni, however being viewed as my own person first before my dad seems like such a hard ask sometimes. Even some of my closest rowing mates still see me, introduce me and treat me as 'Laurie's daughter' not plain Louisa first and foremost. Wishing for once, the announce wouldn't mention who my parents are. This has happened to me, I was rowing down the last 250 meters of a race and I could here the announcer call "and Miss Louisa Anderson, yes the same Anderson as our own very Laurie Anderson." I came second in that race but I remember hearing that and thinking what that had anything to do with my rowing. Besides the rowing part of the book both characters deal with the stresses of school, friends and romances. Cristian was a complex character, when he wasn't pining after Penny. He had to face the darker side of rowing, the disappointment when being dropped from the first eights and the pressure of trying to make it back into the best boat. I eat when I feel like this, trying to fill the empty feeling with sugar and fat. It works for a bit, then more blackness comes in its place. It was refreshing to have a male character deal with an eating disorder and then the dependence on performance enhancing drugs and finally his resolution. Cristian and Leni go through a significant amount of character development which was subtle enough to not notice until the tail end of the middle. You can see how changed they are and how much they've grown. No matter what else this book is saying you can tell how much the author loves the sport and how much respect she has for rowing. It's definitely a special sport that once you become apart of if it's hard to stop being apart of it. "That's why I want you to row. You'll meet people who'll stick by you no matter what. Who will show you more kindness than you can stand." I would like to preface this review by saying that I ordinarily actively avoid books-about-sports because I don't really understand sports. The only sport I follow is AFL because my family would not tolerate it if I paid no attention whatsoever to who's going to make the eight. The extent of my involvement in actual sports involving me was playing Aussie Rules in primary school, and only making the team because my school needed to make up the numbers. I took a chest mark and kicked it out of bou I would like to preface this review by saying that I ordinarily actively avoid books-about-sports because I don't really understand sports. The only sport I follow is AFL because my family would not tolerate it if I paid no attention whatsoever to who's going to make the eight. The extent of my involvement in actual sports involving me was playing Aussie Rules in primary school, and only making the team because my school needed to make up the numbers. I took a chest mark and kicked it out of bounds on the full and that was the extent of it (I still got a medal). I swam a bit as a kid but I didn't like swimming competitively. I'm not known for my coordination. I'm a thinking, brainy, sitting-at-home-and-pondering-the-universe person. I'm not a person who can judge distance or move at speed with grace while simultaneously not dropping the ball or participate effectively in a team without getting distracted by an interesting looking tree. That said, Head of the River is a novel about rowing, so it's a sportsy novel, and despite my non-sportsy nature, I loved it. I really enjoyed Pip Harry's debut novel I'll Tell You Mine, but I felt her sophomore novel even more authentic, engaging and compelling. The technical detail added to the realism, a strong sense of what it's really like to row competitively and have such a ridiculous amount of expectation placed on you. Doping in sports is very relevant, and the motivations of the characters well-drawn - despite both Leni and Cristian making some less-than-stellar choices, they remained characters with whom I could empathise and I wanted things to work out well for them. I can't relate to the performance-enhancing drugs bit because there aren't any performance-enhancing drugs you can take to make you a better writer (I think there's a movie about this? I wouldn't take them even if they did exist. I'm a bit funny about taking panadol), but I could relate to their ambition and, to some degree, the pressure they experienced. Disclaimer: I met Pip Harry at a writing retreat and so know her personally. I'm a tough critic, however, and would never rate a book five stars if I didn't mean it. It's hard to know where to start in a review for this novel, which is about so many things and so lovingly written. Ostensibly built around competitive rowing and the drive of a pair of Australian twins to live up to their parents' Olympic accomplishments, Head of the River layers in the complexities of growing up, of letting go, and Disclaimer: I met Pip Harry at a writing retreat and so know her personally. I'm a tough critic, however, and would never rate a book five stars if I didn't mean it. It's hard to know where to start in a review for this novel, which is about so many things and so lovingly written. Ostensibly built around competitive rowing and the drive of a pair of Australian twins to live up to their parents' Olympic accomplishments, Head of the River layers in the complexities of growing up, of letting go, and of learning some hard lessons along the way. It delivers multidimensional relationships and big, decadent themes while subverting stereotypes. It brings together a cast of characters who are compelling and flawed and wholly real. Leni is a young woman who, more than anything else, is afraid of disappointing herself. She hits her books hard and hits her training even harder, making her often uncomfortable with the reputation she's crafted: one where fun isn't part of her profile. She's clumsy with relationships and finds it difficult to let her guard down. She's very close, though, to her twin, Cristian, who is thoughtful, gregarious, and secretly plagued with self-doubt and body image issues. Cris finds himself swayed by the strong wills of those around him, accepting the expectations of his parents and coach like a mantle he must live up to at any cost. Leni and Cris's push and pull is beautifully executed, allowing the pair to find strength in each other as well as their individualism. Because this novel is longer than a lot of contemporary YA, the story and characters have plenty of room to breathe. There's a risk of the plot feeling slow or overburdened, but the voices of both narrators are too authentic and enjoyable to allow for that. Instead, the transformation Pip Harry guides her characters through blends humor and some heavy moments in a way that that never feels forced, preachy, or condescending. 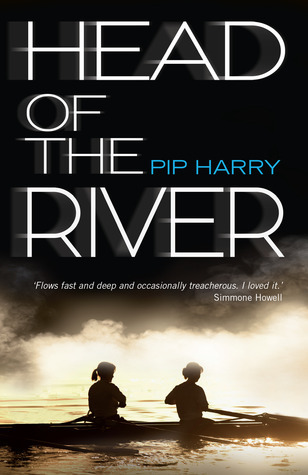 Head of the River by Pip Harry was a highlight of my 2014 reading year. It was absorbing and captivating, unpredictable and unique and is a brilliant addition to our much-praised and thriving Aussie YA scene. Pip Harry is one of those YA authors who capture the teen voice and experience so authentically and without condescension. Her characters are brave and true and flawed and the kind of teen who, were I to meet them in real life, have the power to inspire adults with their courage and intelli Head of the River by Pip Harry was a highlight of my 2014 reading year. It was absorbing and captivating, unpredictable and unique and is a brilliant addition to our much-praised and thriving Aussie YA scene. Pip Harry is one of those YA authors who capture the teen voice and experience so authentically and without condescension. Her characters are brave and true and flawed and the kind of teen who, were I to meet them in real life, have the power to inspire adults with their courage and intelligence (in spite of making some foolish decisions ;) ). One of the reasons I love contemporary YA is because it's a genre that lends itself so well to capturing emotion and placing readers in the characters shoes. Harry excels at this: the emotion and passion and pressure is captured so viscerally -- giving an immediacy and realness to everything Leni and Cristian go through. It's incredible -- the kind of commitment and dedication it takes for teenagers to train and compete and perform. While Head of the River centres around Lani and Cristian's rowing -- there are just so many more themes that seamlessly blend into the work. Though the themes could lend itself to something more heavy-going, Harry's prose reads effortlessly and I found myself sailing through, finding it all too easy to keep reading just-one-more-chapter. The strength of Harry's writing is how the characters are so honest on the pages. They have hopes and fears and keep secrets, they crush and swoon and are let down. This is a story that explores highs and lows. One thing I loved: while some plot threads were heading towards obvious disaster or conflict -- nothing was predictable and everything played out so organically it felt real. Leni and Cristian Popescu having rowing in their blood. Both parents have been Olympic champions and it seems like nothing can stop a meteoric rise to the top of their sport. Leni is on top of her game, training hard and loved up with her boyfriend, Adam. Cris, however, is flagging. Overweight and inherently lazy, as many 17 year olds are, he wants to keep his seat in the first eight without having to put in the hard yards. As Leni's star rises and she is made Captain of Boats, Cris loses his se Leni and Cristian Popescu having rowing in their blood. Both parents have been Olympic champions and it seems like nothing can stop a meteoric rise to the top of their sport. Leni is on top of her game, training hard and loved up with her boyfriend, Adam. Cris, however, is flagging. Overweight and inherently lazy, as many 17 year olds are, he wants to keep his seat in the first eight without having to put in the hard yards. As Leni's star rises and she is made Captain of Boats, Cris loses his seat in the first eight, along with Leni's boyfriend, Adam, who is also his best mate. Adam comes up with a solution - he and Cris begin taking steroids to help them regain their places in the eight. After he and Leni break up, Adam becomes even more determined and he and Cris are set on a path that will end in devastation for everyone involved. Leni becomes attracted to a new boy, Sam, who has also been made Captain of Boats, and she, too, is set on an emotional roller coaster that threatens to derail her rowing ambitions. I found this novel was set in a world I knew little about growing up (rowing, private schools, drug use), but I still recognised the kids at this school as people I might have known. Leni and Cris's parents are really well-drawn, particularly her Romanian father, and I found all the characters relatable. Leni is a great character with believable flaws and believable strengths. She is loyal and committed to rowing, sometimes to the detriment of her other relationships. Cris reminded me of my son - sometimes struggling to find his place in the world and looking for a moment to shine. This is a great story about friendship, rowing and what is really important in life. Definitely an engaging novel for the young adult reader. Last book read in 2014 and it was so good! Learned about rowing, Romanian food and basically, the lengths we humans go through to get what we want. Def one of the best reads this year! Leni and Cristian Popescu are twins. Both are scholarship students to a prestigious Melbourne school for their ability in rowing. Offspring of Olympic champions, Leni and Cristian look certain to guide their school to victory in the Head of the River race on the Barwon River. It’s six months until the Head of the River. Cristian is overweight, having indulged a little too much in the food he loves and less of the training he needs. He finds himself dropped from the firsts, down to the seconds bec Leni and Cristian Popescu are twins. Both are scholarship students to a prestigious Melbourne school for their ability in rowing. Offspring of Olympic champions, Leni and Cristian look certain to guide their school to victory in the Head of the River race on the Barwon River. It’s six months until the Head of the River. Cristian is overweight, having indulged a little too much in the food he loves and less of the training he needs. He finds himself dropped from the firsts, down to the seconds because of his lack of fitness. However, if he can get himself back to peak, he’ll earn his way back to the firsts. Cristian tries, he does but he cannot resist the lure of kebabs and other fatty foods. When his friend, who was dropped down to the seconds for being too small comes to him with a way they can both get back to the firsts, Cristian is tempted. Anabolic steroids and diet pills will help him lose the weight and build the muscle. And they don’t test in school, right? It’s just until he gets back to where he needs to be. Then he’ll stop. Leni suffers from a lack of confidence, in herself and in her team. She’s always been so focused, so set on her goals. She wants it badly but with study, a failing relationship, an intriguing new boy and the struggles of teenage life, Leni can see her dream slipping away. Both of the twins are under enormous pressure and it’s all starting to come apart. I loved Pip Harry’s first book, I’ll Tell You Mine and I’ve been meaning to read this one since it came out last year. It begins two days after the Head of the River race and someone is fighting for their life but you don’t know who or what happened. Then it goes back six months, to when preparation begins for the famous race. I have to admit, I didn’t grow up here so I’d never heard of the race but my husband looked at me like I was an idiot when I asked him if he knew what it was, so obviously it’s pretty big. He grew up in Colac and apparently there was a regatta on the lake down there every year, something the whole town went to. I don’t know much about rowing, other than the Olympics and the Cambridge/Oxford rivalry but it seems as though it’s pretty well established in Melbourne. Leni and Cristian aren’t from a wealthy background like a lot of their fellow students. They were accepted into the school on their grit and talent, both having been taught to row by their Olympian parents. Their father Vasile is Romanian born who emigrated to Australia to marry their mother after the fall of communism and then rowed for his new country. Vasile is brilliant and knows what he’s doing but his tenuous grasp on the English language has held him back. He’s the boat caretaker for Harley Grammar, their exclusive private school but is probably deserving of coaching at least the seconds, maybe even the firsts. Their mother Jodie is a medal winner for Australia and now works long shifts as a nurse. Money is always tight and they live in Fitzroy as opposed to the big mansions in Toorak that other families from the school reside in, but they get by. They’re a tight-knit family, although there are some cracks beginning to show as Leni and Cristian begin their preparations. Leni and Cristian are amazing characters. They both give voice to the narrative here and it switches between them seamlessly. Pip Harry has done a fantastic job at capturing them separately and together as a sibling unit. Leni is so focused, so driven that it’s almost like she barely has any time for anything else. She’s always training or studying to keep up her perfect grades. She has few friends and although she has a boyfriend, she’s conflicted about the relationship. He’s a perfectly nice guy, very popular but he doesn’t give her the flutters. There’s a new guy, someone who has made the firsts incredibly quickly, much to the resentment of some of the other students. He gives Leni the flutters but he’s also complicated and she cannot work him out. Leni is pretty solitary and it seems that in the end, it’s where she falls down. Their rowing is a team sport and she needs to learn to develop that trust in her teammates, to believe in them that they will all be a part of getting her where she wants to go. You really see Leni change and evolve over the course of the book as she makes tentative steps towards friendship with her team, opening up and allowing them to see a different part of her, the part of her that isn’t just Rowing Leni. Cristian is far more sociable and popular than Leni – he loves hanging with his friends, the camaraderie of being on the team. When he’s dropped to the seconds, he’s devastated. He’s swayed to try using something to help get him back into shape and although he’s conflicted over what he’s doing, feeling a terrible guilt he is ecstatic at the immediate results. He’s dropping weight and building muscle, his times are amazing and he’s assured to get back into the firsts. But taking this way out will come at a price for Cristian and a far greater price for someone else. Throughout the book, the incident that is alluded to in the beginning was hanging over me as I occasionally wondered who it might be and why. When it happened, I felt that it still managed to take me by surprise, especially the way in which it played out. Head of the River is an engrossing story but it’s the characters that make it shine, especially all of the Popescu family. They showcase what it might be like for children to grow up in the shadow of famous parents and try and make their own way in a sport that their name is already famous in. Vasile is a brilliant character, he’s a bit arms-waving wildly overexcited eastern European sporting father at times but then he’ll show a remarkable sensitivity and ability to engage with his children on a much deeper level. I was a bit surprised he never questioned the change in Cristian, but that is perhaps the biggest example of how he was a father first to him, coach and cheer squad second. He simply could never have imagined that his own child would do that, even when it’s revealed late in the book that there are clearly people who have their suspicions, whether it’s borne out of jealousy or out of a true curiosity and hunch. This review has been hidden because it contains spoilers. To view it, click here. Basically Head of the river is about 2 rowers who are tall, gifted and the offspring of Olympians (rowers). Leni and Christian are set to row Harley Grammar to victory in the Head of the river race. They have six months till the race and the story tells us about many things that happen during that time, to improve their performance and also many distractions including boyfriends and school grades. Christian ends up using performance enhancing drugs to improve his performance and keep him in the Basically Head of the river is about 2 rowers who are tall, gifted and the offspring of Olympians (rowers). Leni and Christian are set to row Harley Grammar to victory in the Head of the river race. They have six months till the race and the story tells us about many things that happen during that time, to improve their performance and also many distractions including boyfriends and school grades. Christian ends up using performance enhancing drugs to improve his performance and keep him in the firsts as his future starts to fade; with no risk or is there? The story takes place at the rowing sheds most of the time or out on the river but school and home is referenced a lot. In the beginning it is mostly at home as the event that comes at the end of the story is introduced without you knowing. Leni and Christian are main characters of the book. Leni is a independent girl who is focused on school and rowing but has a boyfriend that supports her in rowing. She is very gifted in rowing and continues to be the stoke of the girls first VIII but there comes a problem where she is slowly stripping off her gifted abilities. Where as Christian is focused on school grades and rowing but slowly focuses more on rowing but likes to cheat as he faces a dilemma where he is beginning to gain weight. He also is always trying to get this one girl called Penny who is in Leni’s crew. There is another character who is called Adam, who supposedly drags Christian into making one big bad decision but he suffers the consequences. A problem Adam faces with Christian is keeping his place in the firsts boat but also trying to keep his girlfriend Leni. Leni and Christian’s parents also play a main role in the book as they have strong opinions, well at least their dad does and he is very very disappointed by some bad decisions his son made and the outcome that came along with it. First Leni and Christian do there first regatta before head of river and get a promising result but can tell they both need to make some improvements. Also the boy’s crews have re-trials during the season and it is looking hopeful that Christian stays in the firsts but there is a chance he gets bumped down to the seconds because of his weight and also needs to maintain his grades and rowing for his scholarship. Whilst that is happening Leni is having a good time enjoying early mornings. Later Christian gets beaten by Sam in his single scull because he falls out which means he isn’t in firsts anymore and makes his dream of captain of boats eliminated. After that Leni is starting to realise that Adam is getting annoying, but tries to focus on getting captain of boats and school to keep her scholarship. After that rowing camp is approaching and this means the final trials for the season are coming up. Christian needs to find a way to lose some weight and gain fitness and Adam needs some meat on him so, Adam found a guy at his gym who was offering performance enhancing drugs for both of them to improve and make their spots. They get the spots but people find it suspicious but whilst that is happening Leni pulls out of her 2km erg and ends up being demoted from stroke seat to behind her enemy. After that Leni realises that she loves someone… but is not Adam. Adam and Christian continue on their drugs and plan to use it all the way up until head of river. While on that camp Leni and someone share some love without getting caught but he realises they shouldn’t have done it but Leni doesn’t regret it and he ignores her because he never told her about someone else he was dating. After that everything falls downfall for Christian he gets caught for doping… and Leni becomes captain of boats and their family get a boat named after them on behalf of their dad. In the end Leni talks to the supposedly love of her life. A big even happens at head of river besides from the fact that Leni’s crew win. I like this book a lot because I can understand it. I can understand everything that happens even though it doesn’t happen as common in our days. Since I do this sport I understand how this one event is so important and why Christian sacrifices his reputation against his dads. Also it wasn’t actually very predictable despite it seeming obvious… a boy takes drugs, he either does or doesn’t get caught. The book was a bit confusing and I only just got some of it when I read over the beginning again, as it actually starts off with the sad news but you don’t realise because it hasn’t actually told you what happened, you just know that someone is in hospital. Also I do like the ending because there are new relationships that are forming that were meant to be in the beginning but end up happening right at the end. But then again the ending is bad because something terrible happens to someone and I wasn’t expecting it at all. I connect with this book, more specifically one of the characters Leni, in the sense that I was something special in the sport but starting needing to work harder to try and be something special. I like how the author starts off with main event of the story without you realising… that what I like about Pip Harry’s style. I would recommend this book especially to rowers but also to people in the sport industry because this just helps explain the sorts of things that go through kids heads in these kinds of situations. I also recommend it to anyone who happens to pick it up because it really describes rowing and what it can be like and even though you may not be interested in it actually relates to any type of sport of activity you may do. “Believe me, my young friend, there is nothing – absolutely nothing – half so much worth doing as simply messing about in boats.” ~ Kenneth Grahame, The Wind in the Willows. Also I rate this book 4.8 stars out of 5. You don’t need to like rowing in order to enjoy this book. Or even know anything about it (I certainly don’t). You don’t even need to like sport. Take me, for example. I am a great believer in the power of INSIDE over outside. I know nothing about rowing. Okay, I know that Australia’s pretty good at it. And I know that it gives you calluses, because a guy in my grade at school is a rower. So I wasn’t ridiculously excited for this book, because I didn’t think I would be able to relate to it. Head of the River is told in a twin POV…literally. Cristian and his twin sister Leni, children of Olympic rowers, switch between telling the story. Cristian’s story involved emotional eating, taking up drugs and lack of self-esteem. Leni’s, meanwhile, was more about the pressure of the sport and learning to work within a team. Despite having such pressure, being kids of Olympians, I absolutely LOVED the parents in this story (parental involvement, hooray!). The Dad, Vasile Popescu (yes, I am proud I remembered his name), is Romanian and doesn’t speak the best English. He pushes his kids but he also wants the best for them. The Mum is more laid-back, with the attitude that it doesn’t matter what happens – she still loves her kids. And she’s always looking out for Leni and Cris. Then there’s Leni. She’s the over-achiever, the one who gets straight A’s as well as being a champion rower. I think I could relate to her a lot better than I could to Cris – she responds to the pressure by trying even harder, and there’s no release for her, because even the thing she loves (rowing) is a competition. So I could relate to her really well. Both of the twins often reminisce to the start of their rowing, how none of it mattered. Both of them sometimes deal with their issues in ways that aren’t the best, but it’s also a growing process for both of them, and there was a lot of character development there. Leni loosens up a bit and eventually is able to work in a team and have fun with the other girls. There were a few things I wasn’t so keen on, though. Cristian’s main conflict, right towards the end, felt rushed to me – we didn’t see all the consequences of what he’d done, and he seemed (to me, at least) to get off pretty lightly. I also wasn’t crazy about the romance sub-plots, because I didn’t feel they were that necessary in what was already a strong story. Then there was the final ending, which was ABSOLUTELY heartbreaking and a clear message to sportspeople in general – like before, it felt really rushed and there wasn’t enough build-up for it. It kind of came out of nowhere. Well, not out of nowhere because it was hinted in the very beginning. But it had an almost tacked-on effect which felt…not quite as though it was added for shock value, but as though it wasn’t particularly necessary. Head of The River should be read by not only those who are interested in rowing, but for all teens who compete and strive to break into a professional level. It follows the dual points of view of siblings and twins, Leni and Cristian, whose parents are both Olympians and respected members of the rowing community, being only natural to both take up the sport themselves. I really enjoyed seeing both points of view, with Leni at the top of her sport, while Cristian struggled to maintain the same level, often feeling as though he was competing against his sister in the eyes of his parents. He sees Leni as having it all, but not realising that she struggles out of the water, socially, and finding herself in a lackluster relationship while she fights her feelings for new boy Sam. Cristian seemed terribly unhappy, his storyline was more engaging and allowed the reader to relate to his daily struggle with weight and his own mental anguish. The storyline more than ever, is a really popular topic for discussion in Australia at the moment with the alleged drugs scandal at the Essendon AFL club, and the investigation by ASADA, the Australian Sports Anti Doping Authority. But where the media will just report on facts and accusations, we rarely see a personal side of the effects that the scandal had had on players and their families. Although Leni and Cristian are fictional, it allows the reader to see just what sacrifices athletes make for their chosen sport and that they are prone to mistakes, just as you and I are. An interesting book about the pressures placed on young people the world of elite school sport. Money and prestige play a big part in this rather insular world where winning seems all consuming. This novel tells the story of Cristian and Leni Posescu who are twins on rowing scholarships. There are high expectations that they will perform well, partly because their parents are both medal winning Olympians and partly because they must maintain high performances to stay at the school. The pressure An interesting book about the pressures placed on young people the world of elite school sport. Money and prestige play a big part in this rather insular world where winning seems all consuming. Head of the River is not simply a novel about sport. It is about so much more. It is ultimately about friendship, growing up, relationships, identity, insecurities and anxieties when you are becoming an adult and family bonds. Sport is the mechanism but it is not an "issues" book. Wow! I absolutely loved this book, I could barely put it down. I loved how the book started after The Head of the River took place, which gave a sense of foreboding when it went back to 6 months beforehand. you knew something bad was going to happen, but it was impossible to know what it was. I loved reading a book based in Melbourne, as well as about I sport I love. I could imagine the scenes, based on my own experience rowing on the yarra, and I have my guesses about which schools mentioned are loosely based on actual schools. The pressure Cristian and Leni are both under is immense, pressure they put on themselves, from their peers and also from their family, and how they dealt with it was quite different, with Leni obstinate to do well through hard work, and Cristian who succumbed to peer pressure to take the easy route. Leni also grew as a character throughout, from being serious and super focussed on her rowing that she couldn't also have trust and have fun with her crew, to opening herself up more to them with friendship and trust. I had such high hopes for this book. Such incredibly high hopes. And Head of The River exceeded all of my expectations by a mile. Or by 2000m should I say? Being a rower myself made me super keen to read this one, however I didn't realise just how relatable it would be to me. Firstly, Leni. The pressure Leni puts on herself to achieve was so realistic, and her determination was something I'd seen many times before at the lake. Then there was Cristian's desire to eat rather than work and his decis I had such high hopes for this book. Such incredibly high hopes. And Head of The River exceeded all of my expectations by a mile. Or by 2000m should I say? Being a rower myself made me super keen to read this one, however I didn't realise just how relatable it would be to me. Firstly, Leni. The pressure Leni puts on herself to achieve was so realistic, and her determination was something I'd seen many times before at the lake. Then there was Cristian's desire to eat rather than work and his decision to take the easy way out of a difficult situation. Both of these characters were fantastic. Having complex characters like Sam and Adam made this book all that much more enjoyable. In YA contemporary it is unfortunately rare for supporting characters to have extensive development and meaning within the story, but Pip Harry formed hers beautifully. And being a rower, of course made Head of the River a fabulous read for me, but I think that a great thing about this book is that ANYONE can enjoy it. Pip Harry makes sure of this by explaining all of the rowing lingo, and by creating a story that deals with issues that all people relate to. Took me ages to read this, mostly because of life, school and uni and what not, but also because I am not a fan of teenagers who make really bad decisions. It's just so hard to read. And Cristain's choices come from desperation, but he knows he's doing the wrong thing. While Leni's dramas are nowhere near the depth of Cristian's, they are still interesting and well handled. I liked their closeness, although it does take half the book before I really felt that they had each other's back. There's s Took me ages to read this, mostly because of life, school and uni and what not, but also because I am not a fan of teenagers who make really bad decisions. It's just so hard to read. And Cristain's choices come from desperation, but he knows he's doing the wrong thing. There's some sadness here, and it's well written and authentic. The open-ended resolutions are also realistic. A good, solid read. Fiction featuring rowing is unusual and this really is a book where the sport is integral to the story and treated realistically. Even better (and more unusual) is that it is set in a co-ed school and male and female stories are given equal billing. More similarities than differences, strangely enough. The story is told alternately by Leni and Cristian, twins and top rowers, and the children of rowing olympians. They are very different, however, and very real. Proviso: Pip Harry is a friend of mine. That said, I wouldn't rate it here if I didn't like her book objectively. But I do. It's well-written, great pace, fascinating concept and fabulous execution. What I loved most about the book is how it explores the *actual* reality of teenage pressure, romance and aspirations. Things *don't* always end well. Good job, Pip, you had me crying for the entire last 50 pages! Loved this. It had a good heaping of heart and guts. Just like with her first book, Pip had me transported right back into my highschool self -all the good, the bad and the ugly! Was really well done technically - the alternating narration worked wonderfully in capturing all sides to the characters and the storylines. A ripper sophomore book from a great Aussie author who's really starting to make a name for herself. I'll be continuing to sing her praises for sure. Loved the dual narration, but I found it quite detached and almost clinical in parts of Leni's. I'm not sure if that was intentional because of the way that she was, or not, but either way I found in hard to connect to. However, I loved Leni and Cris's stories and bond. There were amazing other characters and a very interesting plot. Overall, I really enjoyed this book. Rare for me to read about sport. I picked this up, hoping it would be good for a particular demographic in our school library. Didn't expect to love it so much. It's not just about sport, but I hate to use the term "coming of age"- isn't every story essentially about that? Well written characters, believable dialogue and a plot that kept me awake, sniffing, late into the night. This book was amazing. I couldn't believe how fantastic it was. It was so fascinating and interesting to read, I could never put it down. You definitely need to row, or know a bit about rowing, to read it, but it's such a fantastic, emotional book. It has been one of the best books I've read, pulling at all my emotions, and I would recommend to it everyone I know. The teenage school rower in me I loving this book so hard for all of the memories it brings back. The librarian in me is loving this book for its honesty, fresh Australian voice and topics that aren't touched on all that often in teen novels such as the pressure of GPS sports and the financial divides at private schools. Another great YA novel from Pip Harry, set in the world of Melbourne private schools rowing. Loved the setting, the characters and the dialog. Highly recommend to those involved or interested in elite teen sports and the issues that arise around them.